TUCSON, Ariz. — An awesome offense has carried UCLA to a terrific season. The Bruins turned to rebounding and defense for what may have been their most impressive win yet. Thomas Welsh scored 12 of his 14 points in the second half and No. 5 UCLA dominated the offensive boards to beat No. 4 Arizona 77-72 in a Pac-12 showdown Saturday night. The Bruins (26-3, 13-3) won their seventh in a row and snapped Arizona’s 21-game home court winning streak. The Wildcats (26-4, 15-2) dropped into a tie with Oregon for first place in the Pac-12 heading into the final week of the regular season. The Ducks hold the tiebreaker by beating Arizona in the teams’ only meeting. UCLA, avenging a 96-85 home loss to Arizona on Jan. 21, trailed 53-49 at the half but took control with a 19-4 second-half run. Allonzo Trier scored a career-high 28 for the Wildcats. Parker Jackson-Cartwright added 11, and Lauri Markkanen had 10 for Arizona. Five players reached double figures for the Bruins, led by Bryce Alford’s 15. TJ Leaf and Aaron Holiday added 12 apiece, and Lonzo Ball had 11 along with eight assists. UCLA had 19 second-chance points to Arizona’s four. In the second half, the Bruins outrebounded the Wildcats 9-1 on the offensive boards. “They were the bigger, stronger, tougher, more physical tam after the ball,” Arizona coach Sean Miller said. The Bruins’ Bryce Alford said the team’s defense had improved markedly since a team meeting following a loss to USC a month ago. The Bruins switched to a zone most of the second half and stretched the lead to 11 twice late in the game, the last at 73-62 on Welsh’s’ inside basket with 4:38 to play before Arizona managed one final charge, finishing the game on a 10-4 run. Markkanen’s two free throws cut the Bruins’ lead to 75-72 with 29.2 seconds to play. 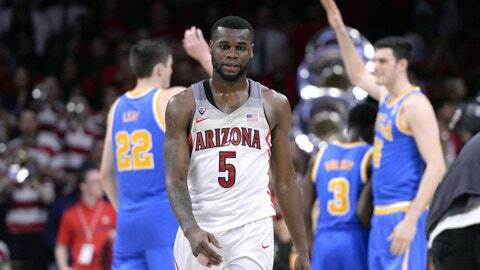 Holiday missed the first of a one-and-one free throw opportunity and Arizona had a chance to tie it but Kadeem Allen, with a dislocated pinkie finger on his shooting hand, threw up an air ball from 3-point range. Miller had no timeouts so the Wildcats had to wing it. After trailing by as many as seven points early, Arizona outscored the Bruins 10-1 over the last 2 1-2 minutes of the first half to lead 43-39 at the break. Jackson-Cartwright scored seven in the surge. UCLA took the lead for good, 54-53, on Welsh’s basket with 12:52 to play. Arizona lost at home for only the second time in 69 games. The outcome in Tucson could set the stage for a rematch between the two teams in the semifinals of the Pac-12 tournaments. Assuming, both teams win out, Arizona would be the tournament’s No. 2 seed and UCLA the No. 3. Oregon would get the No. 1 seed and, barring upsets, would face the UCLA-Arizona winner in the conference title game. The Wildcats play their final regular-season game of the season at Arizona State on Thursday.